The scope and complexity of immigration-related issues have increased since City Council adopted the Toronto Newcomer Strategy in 2013. After several years of decline, global developments, shifting immigration policies and the political landscape has led to an increase in the number of newcomers arriving in Toronto. 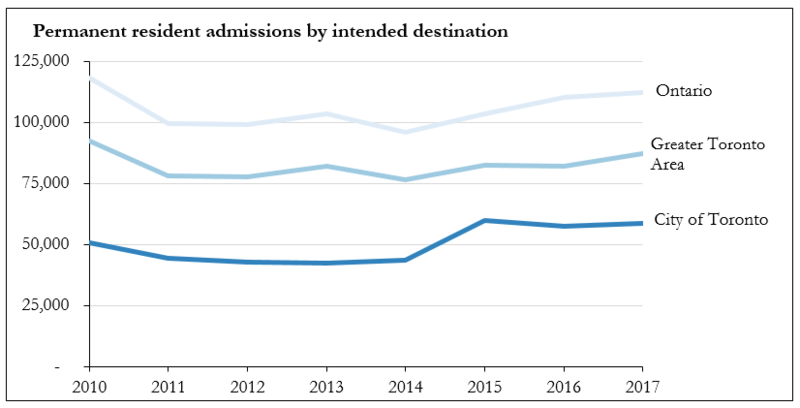 The most notable increase is in immigration classes that have more complex needs, such as resettled refugees and refugee/asylum claimants, a trend which is expected to continue. Toronto welcomes more newcomers than any other city in Canada, with an average of nearly 60,000 new permanent residents every year (see chart below), which presents many opportunities as well as challenges. The City takes a holistic approach to supporting newcomers, with programs, policies and services that complement the not-for-profit, faith, private and other sectors. For example, in the 2014-2018 term, City Council appointed two councillors as Newcomer Advocates to champion newcomer issues. In 2013 and 2015, Council affirmed the importance of immigrants to the city’s civic life by requesting the Provincial Government amend the existing regulation to extend the vote in municipal elections to permanent residents. City divisions, agencies and corporations offer targeted support to newcomers through a variety of programs and services. One example is the Mentoring Partnership offered by the City through which nearly 700 City of Toronto staff have mentored and helped more than 1,600 skilled immigrants succeed in the labour market since 2004. The Toronto Newcomer Office (TNO) is part of Social Development, Finance and Administration (SDFA) and mostly funded by the Federal Government as a city-wide Local Immigration Partnership (LIP). Complementing the four community-based LIPs in Toronto, TNO was established to provide strategic leadership on newcomer and immigration-related issues at the City. Among other activities, TNO convenes the Newcomer Leadership Table, bringing together key stakeholders to address newcomer issues in a coordinated and collaborative manner. TNO facilitates the implementation of the Toronto Newcomer Strategy, Refugee Resettlement Program, Integrating Cities Charter, Newcomer Services Kiosk Program, Toronto Newcomer Day, and develops and promotes city-wide policies related to immigration, including Access T.O. : Access to City Services for Undocumented Torontonians. The lack of long-term, stable funding for Toronto’s Newcomer Office challenges its ability to respond to changing priorities and issues, in particular to newcomer categories that are not eligible to receive federally-funded services, such as refugee claimants. The federal funding comes with significant limitations, including work parameters and eligible activities and clients. supporting engagement and community capacity. In February 2013, City Council reaffirmed its commitment to ensuring that Torontonians, regardless of immigration status, have access to City services without fear of being asked for proof of status. applying principles of equity and diversity in procurement and tendering. In 2018, City Council signing of the Canada-Ontario-Toronto Memorandum of Understanding on Immigration and Settlement (MOU), which provides a framework for discussion, collaboration and action between all three levels of government to support positive outcomes for newcomers. In particular, the MOU recognizes access to employment, access to settlement and other supports such as housing, education and health, and citizenship and civic engagement as primary areas of interest. January 2017 Council re-affirmed Toronto as a Sanctuary City where all residents have full rights to access all city services and city-administered services without fear, regardless of their documentation status.